We’re planning on leaving Sydney in the next year or so, due to starting a family and needing a 4-bedroom house. But where to move to? The choice is overwhelming. In this series of posts, I explore a plethora of possible places – many of which we’ve visited – in an attempt to reach some sort of conclusion. Next up – Morpeth. Morpeth is a sleepy little village of just over 1,000 inhabitants. 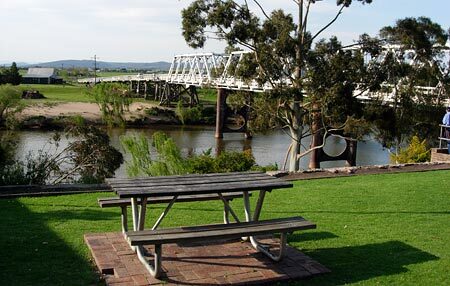 It’s on the edge of the Hunter valley, northwest of Newcastle, and sits on a gentle bend of the Hunter river. Unlike many country towns in Australia, Morpeth actually has a bit of history to it, which appeals to us. It used to be a river port, transporting coal and people via steamer to Paterson, Maitland, Newcastle and Sydney. The village is full of historic sandstone buildings, including the riverside Arnott Bakehouse, owned by the original Arnott family (of biscuit fame). In fact the village is so historic that it has National Trust status. Book your flights online. You can save a fortune compared with high street travel agents by booking directly with the airline on their website. We flew with Emirates and saved ourselves AUD $800 in total. Note that most airlines charge a 10% fare for under-twos. Book bulkhead seats. (Assuming you’re flying economy.) These are seats that sit directly behind the bulkheads (dividers) on the plane, usually just behind business class. They offer a lot more legroom, and you usually get the option of booking a bassinet (see below). Plus your little one can crawl around a bit on the floor in front of you. Be aware of liquid restrictions for air travel. There are exceptions for baby food and so on, but you still need to stick within certain limits. Find out more information on this Australian site. Take your own baby food on the flight. Your baby will prefer familiar food. Although many airlines offer baby food in-flight, your baby may not like what’s available, and the food often has additives such as sugar and salt, too. Bananas are always a good standby when flying. You are currently browsing the The Good Oil: Living in Australia as an Expat weblog archives for December, 2007. Where to live: Blue Mountains? Australian Do Not Call register: success or failure?